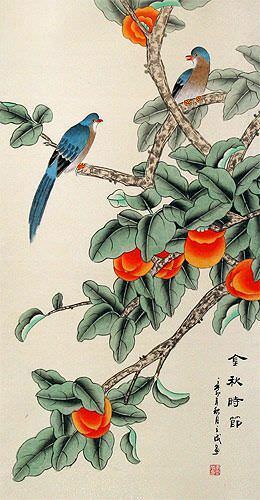 Artwork Panel: 49.2cm x 97.9cm ≈ 19¼" x 38½"
Silk/Brocade: 58cm x 154cm ≈ 22¾" x 60½"
Width at Wooden Knobs: 67cm ≈ 26¼"
This is a lovely wall scroll featuring two birds sitting on a persimmon branch in the Autumn. The Chinese title is "Jin Qiu Shi Jie" which can be translated as, "The Golden Autumn". The rest of the characters indicate this was painted in the Autumn of 2011 and signed Li-Cheng (the artist's given name). The artist's full name is Wang Li-Cheng. I only met him once, and don't have a lot of information about him. I can say he lives in Jinan City in the Shandong Province of Northern China. His artwork speaks for itself. I should head back to Jinan and get more.